Today is the greatest day in the history of Amsterdam. After years of discussions and debates, the city’s ban against scooters using bike paths officially goes into effect on Monday April 8, 2019. Scooters known as “Snorfiets,” occasionally misspelt as SNORT-fiets have slowly been choking Amsterdam into submission. There were 8000 scooters in 2007 and the numbers have swelled to over 35,000 in 2016. These glorified wheelchairs have contributed to the deteriorating perception of safety among citizens. The Copenhagenize Index is aware of this issue and has rightfully knocked down Amsterdam to the number 3 spot among the Bicycle Friendly Cities of the world. It’s difficult for me to have an objective opinion on scooters without verbally abusing some groups or sounding like an angry, drunken sailor. But in this victory I digress, and will give credit to scooters. After all, they are very efficient way to get around Amsterdam. They’re well suited to delivering hot pizza or illegally transporting marijuana to coffee shops. The issue is that scooters simply shouldn’t be allowed on bike paths. Context is important to consider because Amsterdam isn’t Cairo or Bangkok. It’s not a polluted, sweltering metropolis with sprawling roadways where they would excel. Amsterdam is a neat, compact city that has a perfect symbiont relationship with bicycles while the scooter is nothing more than an antagonist. Scooters may travel up to 25 km/hour but research shows that 80% of scooters exceed this limit. Some people have also illegally modified their scooters to go even faster. This is an obvious concern to bicyclists. The disproportionate speed and weight discrepancies will have a dire effect when accidents occur, and they do happen. But there is also the nuisance factor in which every bicyclist in Amsterdam has experienced at one time or another. Scooters constantly disrupt bicyclists travelling in pairs with their incessant honking and buckshot style of riding. They will often illegally transition from the bike path to the road and vice versa in an effort to beat traffic. Couple this with the fact that scooters are the noisiest and stinkiest form of transport only validates the decision to remove them from the bike lanes. 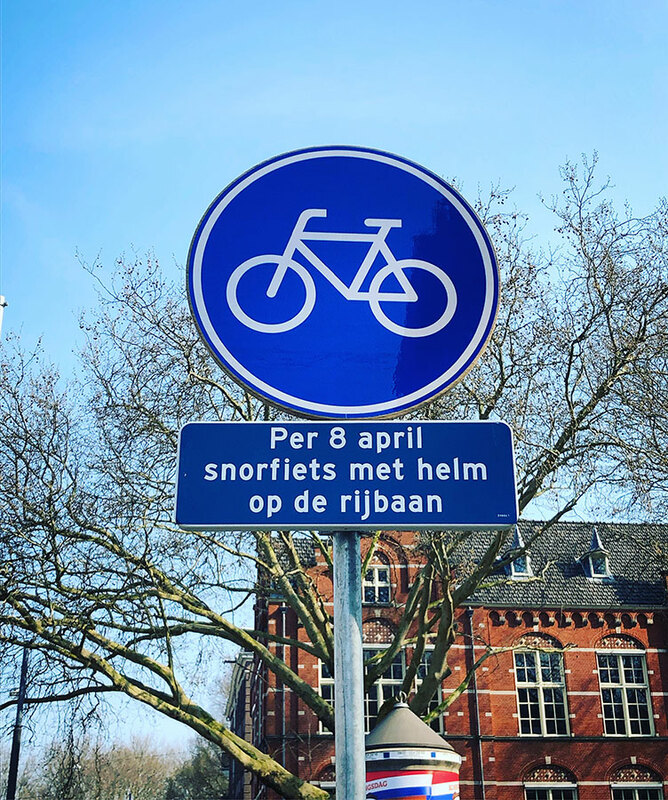 Amsterdam has peppered signs throughout the city notifying citizens of the changes. As a result, the sales of new scooters has plummeted while many people are selling off their scooters at heavily discounted prices. There will be a two month transition period in which traffic enforcement teams will pull over errant scooter drivers to inform them of the new rules. The rules stipulate that all scooters will have to wear a helmet and drive on the street. Anyone caught violating this law will face a €95 fine plus administrative fees. This map by the City of Amsterdam shows all the different situations involving the use of scooters moving forward. The only thing left to do now is to declare this day as a National Holiday, even though Amsterdam is the only municipality in the Netherlands to introduce the ban. At the very least, festivities should be enacted. Perhaps a public dismantling of scooters, or erecting a statue of a 1oo foot tall bicycle made from gold to commemorate the greatest day in the history of Amsterdam.